Arizona is a landlocked state situated in the southwestern region of the United States of America. It has a vast and diverse geography famous for its deep canyons, high- and low-elevation deserts, numerous natural rock formations, and volcanic mountain ranges. Arizona shares land borders with Utah to the north, the Mexican state of Sonora to the south, New Mexico to the east, and Nevada to the northwest, as well as water borders with California and the Mexican state of Baja California to the southwest along the Colorado River. Arizona is also one of the Four Corners states and is diagonally adjacent to Colorado. 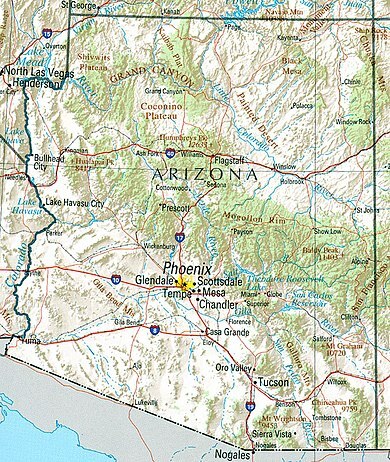 Arizona has a total area of 113,998 square miles (295,253 km2), making it the sixth largest U.S. state. 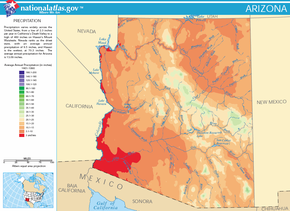 Of this area, just 0.32% consists of water, which makes Arizona the state with the second lowest percentage of water area (New Mexico is the lowest at 0.19%). Arizona spans about 335 miles (539 km) at its widest and 390 miles (628 km) at its longest, and has an average elevation of about 4,000 feet (1,200 m). The geographic center of Arizona is located in Yavapai County, approximately 55 miles (89 km) east-southeast of the city of Prescott. Arizona is divided into 15 counties, and has 90 incorporated cities and towns. Approximately 65 percent of Arizona residents live in Maricopa County, which had a population of 3,880,181 as of the 2000 Census. Maricopa County ranks fourth among the nation's counties in terms of population, and is more populated than 24 of the U.S. states. The county seat of Maricopa County is Phoenix, which is Arizona's largest city and capital. The next most populous county is Pima County, which had a 2000 population of 843,746. The county seat of Pima County is Tucson, where nearly all of the population is concentrated. Combined, nearly 80% of Arizona residents live in either Maricopa County or Pima County, even though the two counties make up 16% of Arizona's total area. Because of the high population of Maricopa County and Pima County, both counties are dominant in state politics. About 15% of Arizona is privately owned, the remaining land consisting primarily of public forest and park land, Native American reservations, military institutions, and swaths of wilderness held by the Bureau of Land Management. Arizona is home to 21 federally recognized tribes, which are each semi-autonomous. The large majority are part of the Navajo Nation, which is the largest Native American reservation in terms of population and size. The Navajo Reservation covers all of northeastern Arizona along with portions of New Mexico and Utah, and had a population of 180,462 as of the 2000 census. Due to the state's large area and range of elevation, there is a variety of localized climate conditions. Overall, most of Arizona receives little precipitation, and is classified as having either an arid or semi-arid climate. The northern parts of the state and the mountainous areas tend to have cooler climates, while the southern parts of the state tend to be warm year round. Precipitation in Arizona is governed by elevation and the season of year. The peak periods of rainfall are during the early winter, when storm systems from the Pacific Ocean cross the state, and during the summer, then moisture-bearing winds sweep into Arizona from the southeast, which obtain moisture from the Gulf of Mexico. Summer rains tend to occur in the form of thunderstorms, which result from excessive heating of the ground and the lifting of moisture-laden air along mountain ranges. These thunderstorms can cause strong winds, brief periods of blowing dust, and infrequently cause hail. The heaviest precipitation is found in the mountain ranges of central and southeastern Arizona, while the driest conditions are found in the arid regions of southwestern Arizona. While the desert parts of Arizona are renowned for their warm climates, snow is not uncommon to portions of Arizona. From November through March, when storm systems from the Pacific Ocean cross the state, heavy snow can accumulate in the mountains of central and northern Arizona. Moderate snow can occur as far south as Nogales, Arizona, which is located on the southern border with Mexico, since it experiences below-freezing nighttime temperatures during the winter. 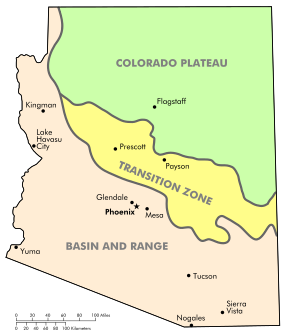 Arizona can be divided into two major physiographic regions: the Colorado Plateau and the Basin and Range Province, and a transitioning zone between the two called the Transition Zone. The Colorado Plateau is a semi-arid, mostly flat-lying region ranging from 5,000 to 8,000 feet (1524 m to 2438 m) in elevation,  centered on the Four Corners region. The Colorado Plateau encompasses an area of approximately 140,000 square miles (360,000 km2). It consists of northern Arizona, except for a small portion of northwestern Arizona. The Plateau ends with the steep rock wall of the Mogollon Rim, which defines the southern edge of the plateau. The Colorado Plateau has the nickname "Red Rock Country" because of its brightly colored sedimentary rock left visible by dryness and erosion, and protected from deformation. The geology of the Colorado Plateau is exhibited by the canyons of the Colorado River, and the Grand Canyon exposes one of the most unusual rock sequences in the world. The area hosts many distinctive natural features unique to Arizona, including the Grand Canyon, Antelope Canyon, Meteor Crater, Painted Desert, and the Petrified Forest. The mountain ranges of the Transition Zone include the Mazatzal, Santa Maria, Sierra Ancha, and White mountain ranges. Because of the range of elevation within the Transition Zone, climatic conditions can vary widely over small areas. The Transition Zone tends to be one of the areas of Arizona to receive heavier rainfall due to its mountainous terrain, and experiences a variation in temperature by altitude. 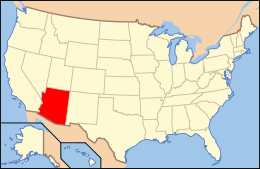 The Basin and Range Province is a region occupying the southern part of Arizona, along with a strip of land consisting of the western part of the state. It is also part of a much larger region encompassing southwestern New Mexico, western Utah, and virtually all of Nevada, and extending into northwestern Mexico. The Basin and Range is characterized by steep, linear mountain ranges alternating with lengthy deserts. The mountain ranges, which poke through the lengthy desert plains surrounding them, can rise above 9,000 feet (2,700 m), and create biological islands inhabited by cool-climate plants and animals. The geology of the Basin and Range is the result of crustal extension of the North American plate. Due to the crustal extension, the area of the crust underneath the region is some of the thinnest in the world. The Basin and Range supplies nearly all of the copper mined in Arizona, and contains other minerals such as gold, silver, and barite. The major rivers of Arizona are the Colorado River, and one of its main tributaries, the Gila River. Nearly all of Arizona is drained by either the Colorado River or one of its tributaries. The Colorado River is vital to Arizona because of the perennial dryness of the region. The river is famous because of its role in the creation of the Grand Canyon, which was created over a period of six million years. Several irrigation systems divert water from the Colorado River, of which the one most vital to Arizona is the Central Arizona Project. The Central Arizona Project, which is 336 miles (541 km) long, diverts 1,500,000 acre feet (1.9 km3) of water from Lake Havasu City into central and southern Arizona. The river is also utilized for hydroelectric power through various dams along the river. The dams on the Colorado River, going downstream, are the Glen Canyon Dam, Hoover Dam, Davis Dam, Parker Dam, Imperial Dam, Laguna Dam, and the Morelos Dam. The Gila River is 650 miles (1,050 km) long, and extends from southwestern New Mexico to its confluence with the Colorado River near Yuma. While the upper Gila River is free-flowing, the portion of the river below the Phoenix area is usually either a trickle of completely dry because of the diversion of water for irrigation. The only major dam on the Gila River is Coolidge Dam, located 31 miles (50 km) southeast of Globe, Arizona. The Sonoran Desert covers the southwestern area of Arizona, including the cities of Phoenix, Tucson, and Yuma. The Sonoran Desert is one of the hottest deserts of the United States, and maintains warm temperatures year round. Despite the sparse amounts of precipitation during the year, the desert is home to a diverse population of flora and fauna because it has two rainy seasons a year. Several plant populations thrive because of their specialized adaptions to the climate, and various species of cactus can be found in the wild. The Sonoran Desert is the only place in the world where the saguaro cactus grows in the wild, and the fishhook, prickly pear, and organ pipe are among other types of cactus found in the Sonoran Desert. Northwestern Arizona contains part of the Mojave Desert, which is at a higher altitude than the Sonoran Desert. The boundaries of the Mojave Desert can be determined by the presence of Yucca brevifolia (Yucca palm), which is endemic to the desert. Unlike the Sonoran Desert, the Mojave Desert has few trees, both in number and diversity. The Painted Desert is a broad area of badlands located on the Colorado Plateau in Northern Arizona. It covers at least 146 square miles (380 km2), and stretches from 30 miles (48 km) north of Cameron, near the Grand Canyon, ending just beyond the Petrified Forest. The Painted Desert derives its name from the multitude of colored sediments and bentonite clay seen from its Chinle rock formation, left exposed by erosion. In the southern portion of the desert, the remains of a Triassic period coniferous forest have fossilized over millions of years. Most of the Painted Desert is located within the Navajo Nation, and is only accessible by foot. A small portion of southeastern Arizona is part of the Chihuahuan Desert. Because of its higher elevation in comparison to the Sonoran Desert, it tends to have milder temperatures during the summer. Arizona is the third largest state to not have an ocean coastline—after Montana and New Mexico. Despite being landlocked, Arizona does contain islands, even though the state has the third lowest amount of water at only 363.73 mi² (942 km²) after West Virginia and New Mexico. Arizona's 0.32% of water is the second lowest percentage after New Mexico's 0.2% of water. The majority of Arizona's islands are in the Colorado River (mainly Lake Mead). Lake Roosevelt also contains a number of islands. Arizona is a fairly mountainous and rugged state, and is home to the world's largest contiguous ponderosa pine forest. Many mountain ranges exceed 9,000 feet (2,700 m) in elevation, and some can hold snow all summer. Arizona has 194 named mountain ranges. The highest are along the southwest margin of the Colorado Plateau, including the volcanic San Francisco Peaks just north of Flagstaff and the White Mountains of the Mogollon Rim. The Basin and Range region of southern and western Arizona has many rugged ranges existing as sky islands in the Sonoran and Chihuahuan deserts. Humphreys Peak in the Coconino National Forest is the highest summit in Arizona. It is part of the San Francisco Peaks, a volcanic mountain range 9 miles (14 km) north of Flagstaff. It tops out at 12,633 feet (3,851 m) above sea level, and is one of the most prominent summits in the United States outside of the Rocky Mountains. The mountain is high enough to maintain snow cover in summer, when temperatures may not exceed 40 °F. The only maintained trail to the summit is the Humphreys Trail, a strenuous hike that starts at Arizona Snowbowl. Towards the top of the trail Humphreys Peak contains the only area of subarctic tundra south of the Rocky Mountains[ citation needed]. Mount Baldy, located in Arizona's White Mountains on the Fort Apache Indian Reservation, is an eroded mountain peak whose summit is 11,391 feet (3,472 m) above sea level. Its name was given to it by locals because it lacks trees on the upper ridge, giving it a baldlike appearance. Mount Baldy is home to the Sunrise Ski Area. The mountain is not part of a range, just a single prominent peak whose flanks are gentle and peak is rounded, not rugged. This is the same for most of the White Mountains, a geologically old range once as high as the Alaska Range, but that has been eroded away over the eons. Mount Baldy is home to a bristlecone pine forest, and some consider the White Mountains as a Rocky Mountains extension due to similar averages in elevation, tree species, animals, and weather. At 11,148 feet (3,398 m), Paradise Butte is found in the White Mountains near Mount Baldy and Mount Ord, near Sunrise Ski Park. In Apache County, Mount Thomas tops out at 11,121 feet (3,390 m). ^ a b c Weir, Bill. The Land, arizonahandbook.com. ^ U.S. Extreme Record Temperatures & Differences, Golden Gate Weather Services. ^ "NOWData - NOAA Online Weather Data". National Oceanic and Atmospheric Administration. Retrieved December 1, 2013. ^ "Station Name: AZ FLAGSTAFF PULLIAM AP". National Oceanic and Atmospheric Administration. Retrieved 2014-03-04. ^ "NowData - NOAA Online Weather Data". Retrieved 2012-02-02. ^ "Station Name: AZ TUCSON INTL AP". National Oceanic and Atmospheric Administration. Retrieved 2014-04-21. ^ "WMO Climate Normals for TUCSON/INT'L ARPT AZ 1961–1990". National Oceanic and Atmospheric Administration. Retrieved 2014-03-10. ^ "Monthly Averages for Tucson, AZ". Retrieved 2011-03-28. ^ "NOWData - NOAA Online Weather Data". National Weather Service. Retrieved 2012-12-02. ^ "FTP NOAA Weather Data file". National Oceanic and Atmospheric Administration. Retrieved 2016-04-12. ^ Geology of the Colorado Plateau, National Park Service. ^ "Mogollon Rim". Geographic Names Information System. United States Geological Survey. ^ Painted Desert Arizona, Arizona Leisure. ^ United States Census Bureau (Apr 2004). "United States Summary: 2000" (PDF). (Table 17). Retrieved August 29, 2011. 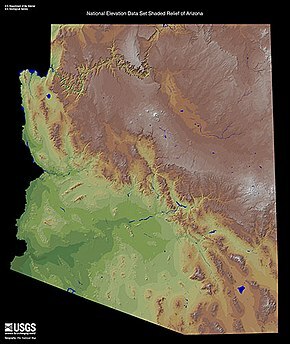 Wikimedia Commons has media related to Geography of Arizona.